ABOYNE HOSPITAL, Bellwood Road Formerly the local authority infectious diseases hospital, this small hospital opened in 1898 and was designed by the local firm of Jenkins & Marr. 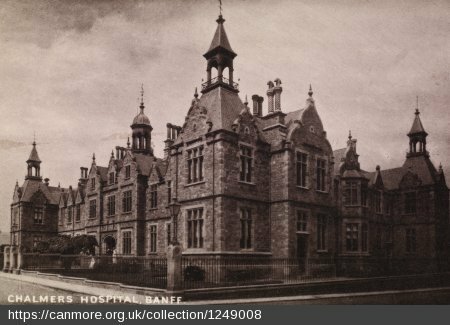 In 1895 the Medical Officer for the Deeside District Committee of Aberdeen County Council had plans drawn up for an isolation hospital at Aboyne, to cost an estimated £1,200. By July 1897 work had commenced. Belatedly there was a move to stop the works and have the hospital built elsewhere, orchestrated by the local landowner, and barrister, Sir William Cunliffe Brooks. 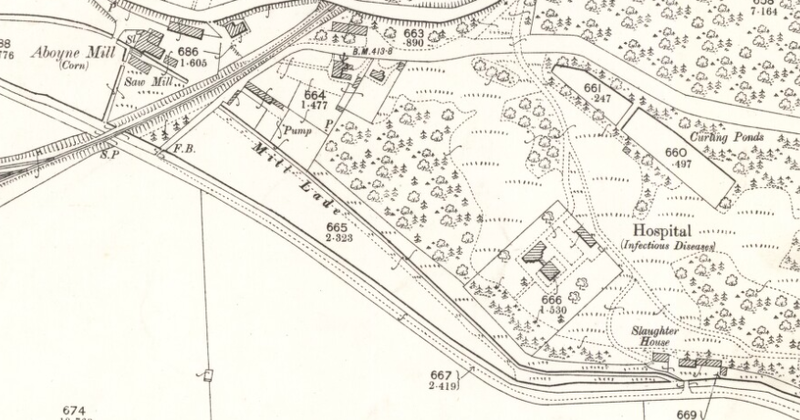 Extract from 2nd edition OS Map, surveyed in 1899, showing the hospital near the railway and next to a slaughter house. Reproduced by permission of the National Library of Scotland. Old postcard showing the main ward block, and a detail showing a patient’s bed on the veranda. By the beginning of August a site about 400 yards to the north-east was being considered, and was agreed to by both sides pending the advice of a Local Government Board official. However, building work on the original site was not halted, and by this time the walls had reached the height of around 6ft. Had the District Committee genuinely been considering moving the hospital, it seems unlikely that they would have allowed work to continue. They had an offer of £1,000 from Sir William to defray the cost of removal, but had commissioned estimates which put the figure at more than twice as much. This they forwarded to the Local Government Board, which, unsurprisingly, declined to visit and declared in favour of the original site. Later in August, the Dundee Courier noted that the hospital was almost ready to be roofed, and that work was proceeding as if no opposition to the site had ever been offered. Sir William and others continued to argue for removal, but the majority of the Deeside Committee voted against the proposals. The hospital was completed in 1898, and soon pressed into use. Any fears that the presence of the hospital would put off visitors to this popular health resort proved unfounded. As originally built the hospital comprised a a central administration building resembling a typical granite-built Deeside house, with a ward block to the north. Its principal elevation is at the rear of the site, facing south, and consists of a compact single-storey block with a steep piended roof. Large dormer windows flank the central high chimney stack and the rose garden in front of it completed the picture. A single-storey detached block to the east presumably housed the wash-house, and other ancillary services. In the 1925-6 a further ward pavilion was built to the south (H. S. Tawse and Allan of Aberdeen, architects). The hospital was transferred to the National Health Service in 1948 and ceased to deal with infectious cases. A Health Centre was added on the site which opened in 1980. ALFORD INFECTIOUS DISEASES HOSPITAL This small isolation hospital built to the north of Bridge of Alford was opened in June 1898. Additions were subsequently carried out by Walker and Duncan, but the hospital closed in 1932. ARDUTHIE HOSPITAL, STONEHAVEN The hospital opened in August 1903 and was designed by Brown & Watt. 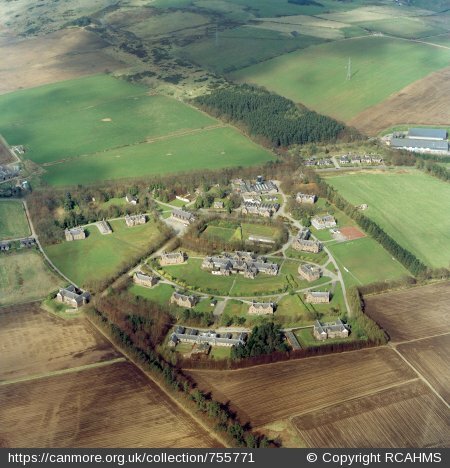 It was built on high ground on the outskirts of the town as the Joint Infectious Diseases Hospital for Kincardineshire and was established by a combination of local authorities. The central two-storey administration block has a domestic appearance with a round-arched doorway and mullioned windows, deep eaves and broad chimney stacks. Initially, the hospital provided twenty beds, but by 1948, when it was primarily used for patients with tuberculosis, this had increased to 45 beds in four ward blocks, and a corrugated-iron sanatorium block which was latterly used as a store. This was still on the site in 1988. BALLATER ISOLATION HOSPITAL This small isolation hospital was built by the Town Council of Ballater. The plans were drawn up by a Mr Ironside, from the firm of Walker & Duncan, in 1910 for a hospital of two wards. One of the wards was to be larger and capable of being divided by a partition to form an extra small ward for any special cases. There was also the usual administration block and a separate disinfecting block. BRAEMAR INFECTIOUS DISEASES This small isolation hospital opened in the Spring of 1901 but had a brief life, closing in 1923. CAMPBELL HOSPITAL, PORTSOY Originally built as a Joint Infectious Diseases Hospital for Lower Banffshire. It was designed by the Aberdeen architect William Kelly and opened in 1904. It follows the usual plan with a two‑storey administration block at the centre, resembling a domestic house, flanked by ward pavilions. It does, however, have a fine pair of gate‑piers with ball‑finials, with simple iron gates and railings on the flanking low stone walls. CHALMERS HOSPITAL, BANFF Recognisably by William Lambie Moffatt with the characteristic shaped, neo‑Jacobean, gables, it has been well preserved and presents a fine street facade. The tall, two‑storey original block has a busy sky‑line with a proliferation of gables crowned at the centre by an ogee‑capped cupola. Funds to build the hospital were left by Alexander Chalmers, who died in 1835. His wife died in 1848 after which nearly ten years of legal wrangling delayed any progress on the building. In 1859 an agreement was reached and in the following year plans obtained from Moffatt. His U‑plan building was rooted in traditional hospital plans, built just too early to be influenced by the move towards the pavilion plan. The wards were linked by a corridor running around the inside court, with the wards facing outwards. 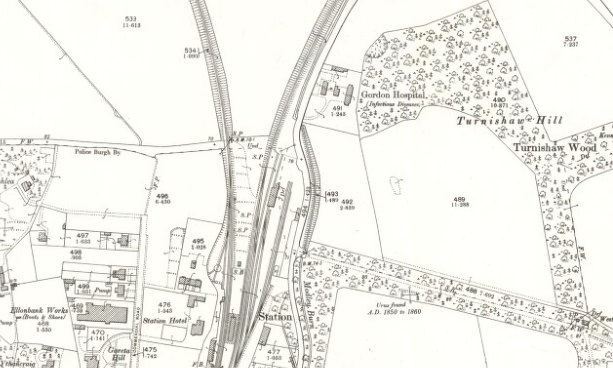 Extract from the 1st edition OS Map, surveyed in 1866. Reproduced by permission of the National Library of Scotland. Many additions were subsequently made but the street frontage remains unaltered. The first extension in 1866 provided separate fever wards. A contemporary account of the History of Banff claimed that the hospital ‘has quite the appearance of Donaldsons hospital in Edinburgh, which is saying a good deal for a Banff building’. CRIMOND COTTAGE HOSPITAL The Cottage Hospital at Crimond opened in 1865 and was the first to open in Scotland, just preceding the St. Andrews Cottage Hospital which opened in the same year. 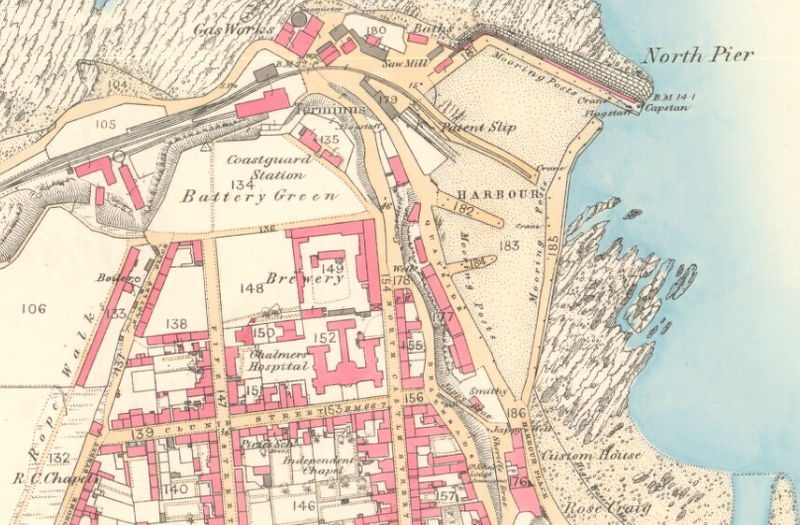 Extract from the 1st edition OS map, surveyed in 1870. Its isolated position makes it unsurprising that it did not last very long. Reproduced by permission of the National Library of Scotland. It was also purpose‑built unlike St Andrews which occupied rented accommodation. However, it was not so long lasting, closing in 1905. By the time the OS map was revised in 1900, the hospital was labelled as ‘old hospital’, suggesting that it may already have fallen out of use by then. ELLON MATERNITY HOSPITAL, Hospital Road (demolished) The Ellon Maternity Hospital was originally built as Gordon Hospital for infectious diseases c.1889. 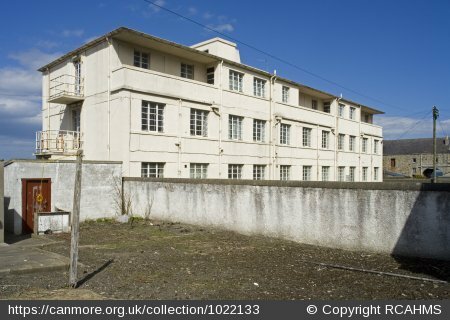 FORDYCE MEMORIAL HOSPITAL, GARDENSTOWN According to the 3rd Statistical Account, in 1933 a nurse’s house with two small wards attached was opened at Gardenstown. Funds for building and partially endowing the hospital were left by Mr. Fordyce of New Zealand, a native of Gamrie. 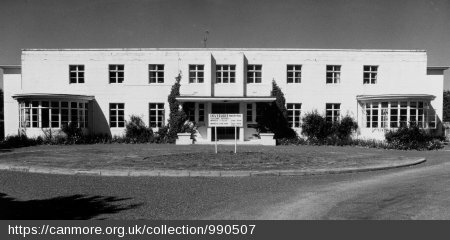 The Fordyce memorial Institute was not transferred to the National Health Service as it was not considered to be a hospital, the district nurse lived there rent free and the endowments paid for the maintenance of the institute. The wards were used as a centre for a children’s clinic. FORGUE COTTAGE HOSPITAL The Forgue Cottage Hospital opened in 1876. According to the Medical Directory for 1904 it was established the preceding year and provided eight beds. It closed in 1926. The building is still extant, having been converted into a pair of semi-detached houses, Clarewood and Morriston. FRASERBURGH HOSPITAL The hospital opened on 27 September 1968, and was designed by Moira & Moira of Edinburgh. It was built on the site of the old Infectious Diseases Hospital and replaced the Thomas Walker Hospital. FRASERBURGH INFECTIOUS DISEASES HOSPITAL (demolished) This Local Authority Hospital was built c.1905 to the south-west of the town. It was demolished to make way for the new Fraserburgh Hospital in the 1960s. FYVIE COTTAGE HOSPITAL, FYVIE Built in 1879 by Colonel and Mrs Gordon of Fyvie to designs by James Duncan this small cottage hospital provided seven beds, originally for medical and surgical cases. It was a single‑storey building with a central gabled entrance bay, and a bay window in each outer bay. 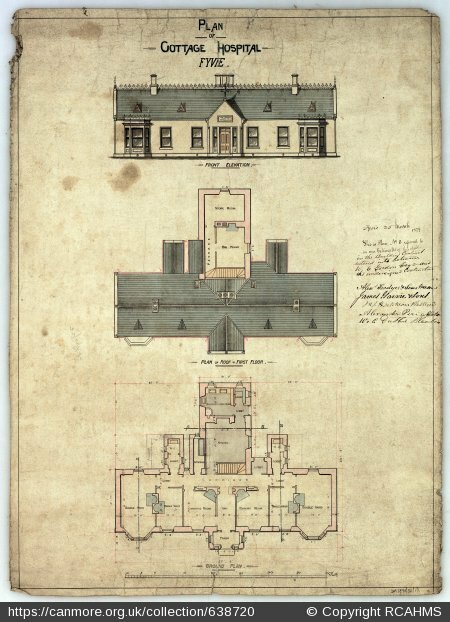 Elevation and plans, Fyvie Cottage Hospital, 1879, James Duncan architect, from the Duncan and Monro collection held by the National Monuments Record for Scotland, RCAHMS. 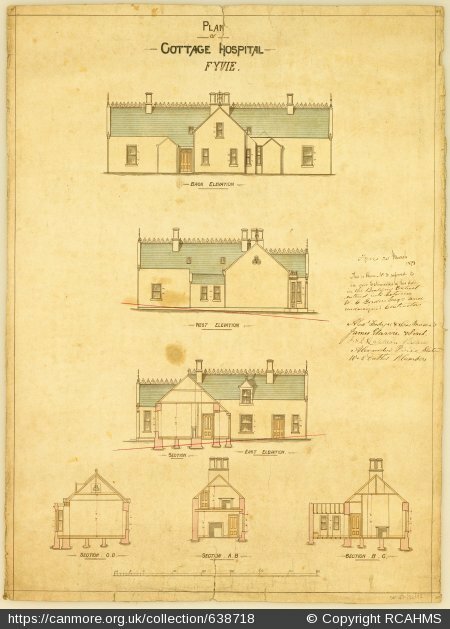 Elevation and sections of Fyvie Cottage Hospital, 1879, James Duncan architect, from the Duncan and Monro collection held by the National Monuments Record for Scotland, RCAHMS. 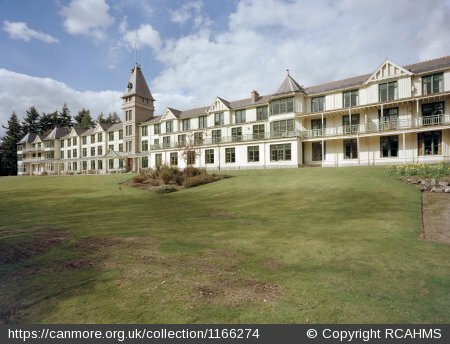 GLEN‑O‑DEE HOSPITAL, BANCHORY, destroyed by fire October 2016 The first Sanatorium to be built in Scotland on the fresh‑air principle. It was designed by George Coutts of Aberdeen and opened in 1900. It was constructed mainly of timber with a central tower of Hill of Fare granite. Balconies and verandas were provided for all the rooms, facing south across the Dee, with access corridors along the north side. The recreation pavilion added to the south‑east below the dining‑hall was built in the same style with windows running all around the block. Stylistically it was closer to the sanatoria in Germany than any others that were subsequently built in Scotland. Two new single‑storey ward blocks were constructed to the rear, the most recent on the site of the former nurses’ home. Its name of Glen‑o‑Dee was changed from Nordrach‑on‑Dee when the building became a hotel for a time in 1934. It was founded as a private sanatorium which treated TB on the Nordrach System pioneered at Nordrach in Baden, established in 1888 by Dr Otto Walther. This treatment mostly consisted of rest in the open air. Nordrach‑on‑Dee was founded by Dr David Lawson of Banchory, who had a distinguished career, pioneering work in the treatment of pulmonary tuberculosis. Before the Hospital was built, much discussion took place as to the site. In 1899 Lawson published an article outlining the criteria and giving details of the eminent committee formed to acquire a suitable site. This committee consisted of, amongst others, Professors of Medicine from Aberdeen and Edinburgh Universities. According to their research Deeside’s record for minimum rainfall and maximum sunshine were favourable. 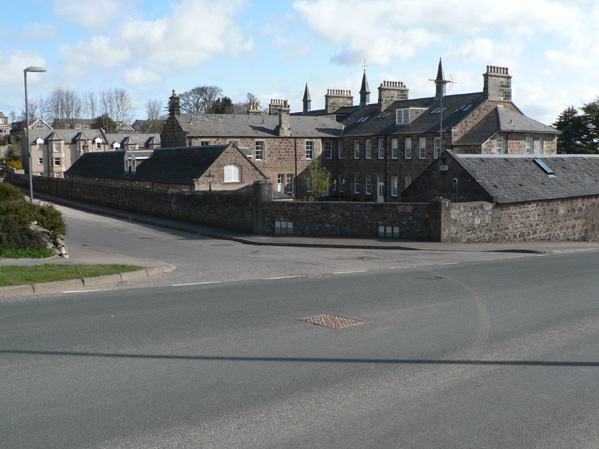 The site was purchased from Sir Thomas Burnett of Crathes for between £5,000 and £6,000. The building itself was estimated to cost £12,000. Initially there were 40 bedrooms though later additions were made. In 1928 Nordrach‑on‑Dee closed and was unused until its re‑opening as a luxurious hotel in 1934. Each room is accordingly constructed so as to admit a maximum of pure sunlight and fresh air. The windows occupy over two‑thirds of the outside wall space and are so arranged as to permit of their being kept open during all weathers. HOUSE OF DAVIOT, INVERURIE The House of Daviot was acquired by Aberdeen’s Royal Cornhill Asylum in 1888. On the site were the two mansion houses of Old and New Glack. The Old House of Glack dates from 1723 and was converted into nurses’ accommodation when it was acquired by the Hospital. It is a dignified three‑storey, five‑bay harled house. In about 1780 the estate was bought by the Reverend Colin Mackenzie, who was reputedly the first person to recognize the therapeutic properties of the mineral springs at Strathpeffer. It was his grandson who built the New House of Glack. This boldly baronial mansion was of recent construction when it was acquired by the Aberdeen Royal Asylum, having only been built in 1876. It was designed by James Matthews and it was his firm of Matthews & Mackenzie carried out the conversion into hospital accommodation. It is a large mansion house with some fine interiors, including plaster ceilings, wood panelling and chimney-pieces as well as a good collection of furniture. There is a fine steading on the estate and in 1935 a butterfly‑plan male hospital block was built, designed by George Bennett Mitchell. INCHMARLO COTTAGE, BANCHORY This convalescent home for children opened in 1886 but only survived for three years closing in 1889. INVERURIE HOSPITAL An earlier infectious diseases hospital was built in Inverurie which opened in January 1897 in Cunninghill Road. It was replaced in the 1930s by the present building. Plans were prepared in 1936 by the architect R. Leslie Rollo and the Medical Officer for Health for the new hospital. Provision was made for 60 beds, 20 in a cubicle block of two storeys and 40 in two single‑storey pavilions. These ward blocks were arranged about a square with the nurses’ home on the fourth side opposite the cubicle block. There was also the administration block with Kitchen, Stores and Dining‑rooms and the usual service buildings. Space was reserved for additional pavilions. The buildings were designed in the stream‑lined manner of the International Modern style, with wide bow windows, on the lines of Tait’s Hawkhead Hospital in Paisley. JUBILEE HOSPITAL, HUNTLY This cottage hospital was opened in November 1889, and was designed by Robert Duncan, a local architect. It was built at a cost of £1,257. KINCARDINE O’NEIL HOSPITAL, TORPHINS This small hospital was built as a War Memorial to those who fought in the First World War. It opened in 1925 and a two‑storey maternity unit was subsequently added to it. The earlier block was built by Robert Robertson, the local carpenter. KINGSEAT HOSPITAL, NEW MACHAR This was the first mental hospital to open in Scotland designed on the Colony or Villa system, and was an excellent example of the type. Built as the District Asylum for Aberdeen, it opened on 16 May 1904, and was designed by A. Marshall Mackenzie. There were three sections to the Colony, the Administrative department, the Industrial Department and Villas and the Medical Section. The Administration Section comprised the Kitchen, Stores, Laundry, Steward’s House, Hall and Medical Superintendent’s House. The Industrial and Colony section comprised four villas for male and female patients and Workshops for the men. The villas were two storied with their own kitchens, dining‑rooms and bathrooms and sleeping accommodation on the first floor. The Medical Section had the Hospital building as its principal feature and also two observation villas. 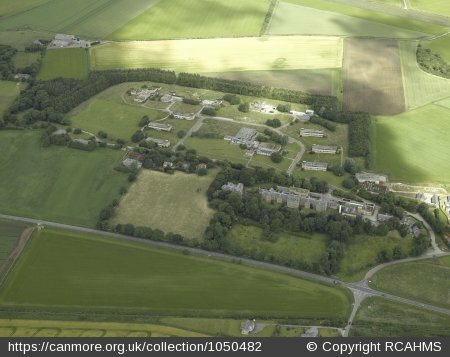 During the Second World War the Hospital was taken over by the Naval Authorities and after the War when it was returned to Aberdeen Corporation it remained empty for some years due to the difficulty of providing sufficient staff. LADYSBRIDGE HOSPITAL, BANFF Built as Banff District Asylum, Ladysbridge Hospital was designed by the Elgin architects, A. & W. Reid, and opened on 6 May 1865. Originally it consisted of the one main block to the south of the present site. Its combination of the H‑plan and Tudor‑style, gabled front elevation tend to give it the air of the contemporary poorhouses. A separate villa for male patients was designed by W. & J. Smith and Kelly and opened in 1903. The main transformation of the site took place in the 1960s when a new central section with recreation hall, dining‑room, shop and tearoom were built, situated up the hill behind the original block and surrounded by new villas. A sculpture group was erected in front of the new main building. LINMOOR CONVALESCENT HOME, PETERCULTER This building was formerly used as a ‘Fresh‑Air Fortnight’ home for children founded c.1889. It later became a convalescent home for children and then a children’s home. It was built partly of stone and partly of wood around a domestic house which was used for administration offices and staff quarters. It was a voluntary institution but also used by local authorities. MAUD HOSPITAL, Bank Street In the minutes for the first meeting of Buchan Combination Poorhouse Board held on 21 April 1866 at the Station Hotel, New Maud, it was decided to invite plans from architects for the poorhouse ‘to be built on a site at or near the New Maud Station to contain 125 or thereby beds or billets, including accommodation for 36 fatuous paupers’. Seven architects submitted plans: Mr Ellis of Aberdeen, Mr Moncur of Edinburgh, Messrs Henderson and Son of Aberdeen, Mr Daniel Mr McAndrew of Aberdeen, Mr Hay of Edinburgh, Mr John Ogilvie of Elgin and Messrs M’Gregor and Millar of Edinburgh. The winning design was by Alexander Ellis. NEWHILLS SANATORIUM, BUCKSBURN (Newhills Home) Now part of a housing development: Christie Grange. Established by a Mrs Smith of the Manse at Newhills who acquired a cottage near the parish church for the purpose around 1870. A new home was built in 1881 and officially opened on 8 July 1882 as Newhills Convalescent Home. By 1900, patients suffering from tuberculosis were occasionally received into the home, and from 1902 they were treated on a regular basis. The home then became the Newhills Convalescent Home and Sanatorium. From 1908 it was run by a publicly-elected executive committee, initially chaired by Dr Walter A Reid. Under his encouragement the Home was greatly extended and modernised. Huts and shelters were erected in the grounds for the outdoor treatment of cases of tuberculosis from 1913 onwards, and in 1916 the admission of non-pulmonary and surgical cases of tuberculosis was sanctioned. The following year, to meet a condition of a generous endowment by Sir Alexander MacRobert, the home was incorporated under the Companies Acts as a company with limited liability. Electric lighting replaced oil lamps in 1924 and some ten years later the worn-out huts and shelters were demolished to make way for two purpose-built modern pavilions. Newhills Convalescent Home and Sanatorium around 1914, from the Handbook and Guide to Aberdeen of that year. OLD DEER COTTAGE HOSPITAL The small cottage hospital at Old Deer opened in 1890 but only survived in operation for fifteen years closing in 1905. 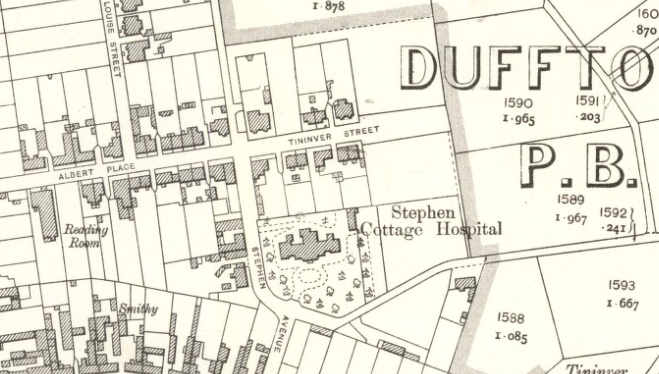 The second edition OS map shows a small fever hospital to the north of Old Deer, which may perhaps be the same institution. PETERHEAD COTTAGE HOSPITAL The hospital was formed from a converted villa in Links Terrace of the later‑nineteenth century. It was substantial granite building of two storeys and attic and remains at the core of the present hospital. A cottage hospital for Peterhead had been discussed in 1925 by Peterhead Trades and Labour Council and was taken up by the Towns Women’s Guild. In 1934 the house was purchased after a contribution of £5,000 from W. B. Shewan to the Town Council. It was converted into a hospital by A. B. Grant. A large extension in the 1960s greatly increased the services of the hospital. PETERHEAD PARISH HOME, UGIE ROAD (demolished) A poorhouse was erected on the northern outskirts of Peterhead c.1849. Detail of the Town Plan (above). It may be that a part of the poorhouse was used as a fever hospital, there are wards marked on both the larger blocks. The square room in the centre is labelled as a kitchen, the small room behind as a washing-house. ROSE‑INNES COTTAGE HOSPITAL, ABERCHIRDER The Hospital was endowed by Miss Rose‑Innes of Netherdale. The foundation stone was laid on 18 May 1891 and the hospital opened c.1894. It was originally for infectious diseases. A maternity ward was added in 1950 but the hospital closed eight years later. It was then adapted as a home for the elderly. 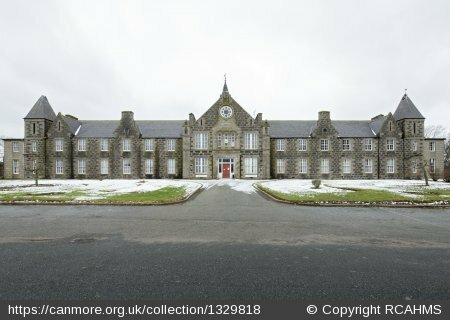 STEPHEN COTTAGE HOSPITAL, DUFFTOWN The Stephen Cottage Hospital was founded by Sir George Stephen, later Lord Mount Stephen, a native of the parish who made his fortune and titles from the Canadian Pacific Railway which he established in 1881. He was knighted in 1886 and became a peer in 1891. With his partner, Lord Strathcona, he maintained links with several Scottish hospitals and also founded the Victoria Hospital in Montreal. In 1888 he announced his intention of building and endowing a cottage hospital in Dufftown for the benefit of Mortlach parish. The plans were drawn up by A. & W. Reid of Elgin. The foundation stone was laid in 1889 and the hospital opened in the following year. It was built of ‘blue sandstone’ from the Richmond and Tininver quarries with corner stones of the creamy coloured Spynie stone. It was constructed on the standard plan with central entrance building containing offices and staff accommodation flanked by two ward pavilions. The hospital was extended in 1899 with further funds donated by Lord Mount Stephen. 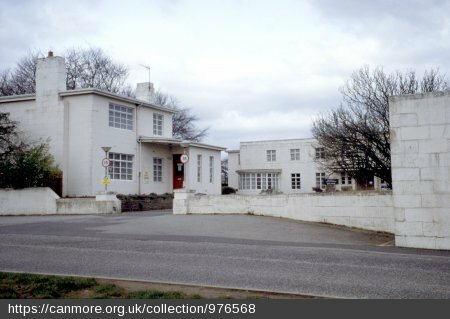 Stephen Cottage Hospital, photographed in the late 1980s (©H. Richardson) Apologies for its lopsidedness. Memorial Window to Lord Mount Stephen, with a depiction of the cottage hospital in the bottom left-hand corner. (Photographed in the late 1980s, ©H. Richardson) The window is in the parish church and is said to be by James Powell & Sons (Whitefriars) Ltd of London, according to the 3rd Statistical Account of Scotland. THOMAS WALKER COTTAGE HOSPITAL, FRASERBURGH The hospital opened on 17 July 1878. The building itself is dated 1877, the date of the foundation stone. It was superseded by the new Fraserburgh Hospital built on the site of the former Infectious Diseases Hospital and closed in 1968. The building appears to still be there, at least the main front part, with a warehouse built to the rear – a handsome little hospital, with two-storey central section and single-storey wings to either side that presumably originally contained the wards. 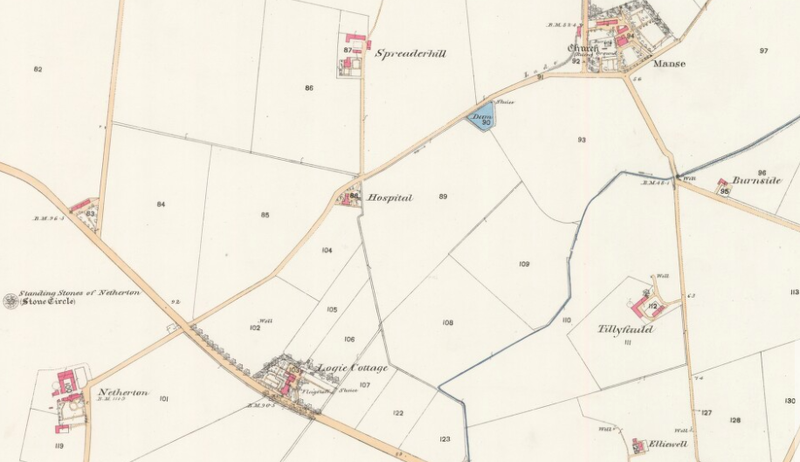 TOR‑NA‑DEE HOSPITAL, MILLTIMBER Tor‑na‑Dee Hospital was formerly the Deeside Hydropathic which had originated at Heathcot, across the Dee. The advertisement above drew attention to the beautiful situation and its easy reach from Balmoral Castle, ‘Her Majesty’s summer residence’, and easily accessible from London by steamer or railway, adding that the climate of Deeside was the most healthy and bracing in Britain. If that was not enough to tempt visitors, there was also preserved salmon and trout fishing for a two-mile stretch on the Dee. The core of the present building was designed by R. G. Wilson and opened on 31 May 1900. It is a muscular building of grey granite with battered walls and arched windows in the upper storey of the centre bay. There is also a fine garden to the front. The character of the building has been somewhat spoiled by unfortunate stair additions and replacement glazing. 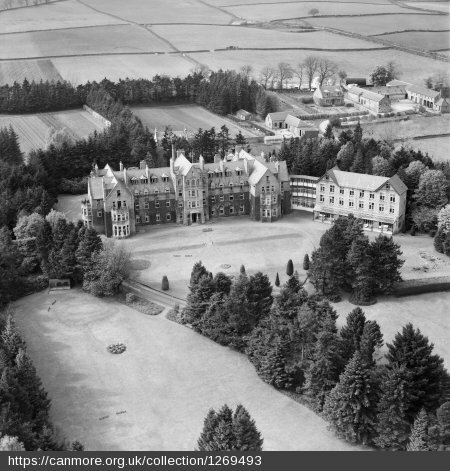 It was converted into a sanatorium in 1918 by Dr Lawson of Glen‑ o‑Dee, particularly to provide accommodation for Officers, invalided from the services with TB. An additional wing was built in 1919 which opened in the following year. TURRIFF HOSPITAL In 1892 Turriff District Committee decided to erect a joint infectious diseases hospital for the common use of the burgh and district. It was designed by James Duncan and has a cottagey centrepiece linked to two plain, outer wings. The hospital opened in 1896 but closed in 1932. It re‑opened, however, in 1936 as a voluntary hospital. A nurses’ home was added in 1936-7 to designs by W. L. Duncan, James Duncan’s son. 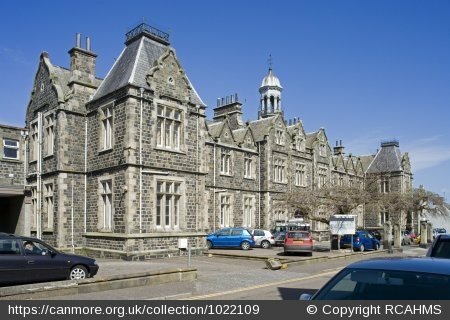 The hospital was still owned by Aberdeen County Council but managed by the local Board as a voluntary concern taking medical and maternity cases. UGIE HOSPITAL, PETERHEAD Ugie Hospital was formerly the infectious diseases hospital for Peterhead. The foundation stone was laid by Provost Leash in June 1905 and the hospital opened in 1907. It was built on the standard plan with, at the centre, the two‑storey administration building of a very domestic character. Valentine’s postcard of Ugie Hospital, probably dating from soon after the hospital was built. The pink Peterhead granite of the façade is enlivened by bull‑faced quoins and dressings, and the patterned small‑pane upper sashes of the windows. It was designed by the Burgh Surveryor, T. H. Scott. The construction cost £4,000 and was helped along with a bequest of £1,500. In 1920 Peterhead Town Council built a small TB annexe and further additions in 1922. WOODCOT HOSPITAL, STONEHAVEN Formerly the Kincardineshire Combination Poorhouse, it opened in August 1867. It is unusual in its choice of the classical style, although it followed the standard H‑plan. It was designed by William Henderson.